Today is the birthday of one of my colleagues. So, we decided to celebrate it at Secret Recipe. I had some Spaghetti Meatballs. Not the best I’ve had, though but certainly the most expensive. Not satisfied with the spaghetti, I ordered a slice of New York Cheese but they ran out of those and the nice and helpful waiter suggested Caramel Cheese, which he said is almost the same.Yep. The cheese part is exactly the same but instead of coffee cream, this one got caramel. I still like the New York Cheese better, though. For the birthday girl, we all chipped in and got her a nice birthday cake. We asked for three big candles and one small one. Well, they ran out of big candles. So the waiter suggested 31 small candles. We said okay. I was picturing it in my mind to be placed around the cake somewhat. 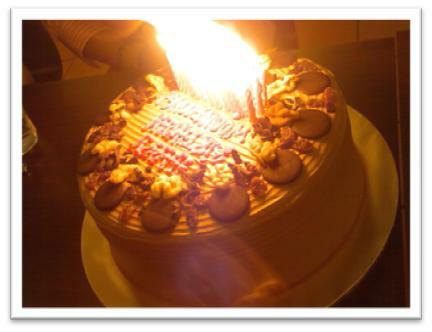 Instead, the staff at Secret Recipe put the candles all bundled up together at the center of the cake. This is one of the nicest birthday celebration in our department but in the end, I think I had one too many cake slices. My head hurts. The colleague whose birthday we celebrated in this post left the company a few months ago. What a pity. Well, I’ll be leaving for a new company myself in about a month. i must say..everytime i need a good laugh, i will surely read this post…haha ngeri sgh!! who were the fool that put the candles all at the center?…and those that were there did not say anything?? for the love of God, lucky nobody got hurt!! The candles were placed by the Secret Recipe worker. Well, I guess he just didn’t know where to put them since that’s the only place left that didn’t have any writing. I just wonder why bother to place ALL the candles… can’t they have used bigger candles to represent the decades and the little ones for the years? What would happen if the birthday is for an 80 year old!